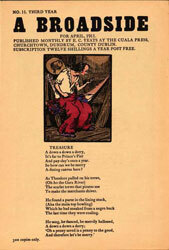 Image from the Broadside "Treasure"
W. B. Yeats, the poet, is a name familiar to most of us. But his brother, Jack Butler Yeats? Visit the Falvey Special Collections exhibition, “Jack Butler Yeats: Drawings & Illustrations,” and learn about this member of the illustrious Irish family. This exhibition consists of two parts, the physical one on display until August 1 and an online version. Both were curated by Róisín Corry Roche, fall ’09 Digital Library intern. Bente Polites, Special Collections librarian, assembled the physical exhibit and Joanne Quinn designed the graphics. Róisín, who has a bachelor’s degree in history from the College of New Jersey, a master’s in Irish Studies from the National University of Ireland, Galway, and a master of science in Library & Information Science from Drexel University, said that she chose this exhibition topic because of her interest in Irish subjects and because Special Collections owns an extensive broadside collection with illustrations by Jack Yeats. While a broadside, by definition, is a large sheet of paper printed on one side, broadsides have been used to distribute folk ballads and announcements inexpensively to a general readership. Later, small presses and publishers took the broadside as a way to feature the fine art aspect of their work. While Jack Yeats worked in many media, the Cuala Press decided to publish a set of broadsides to highlight his work and that of some of the writers in his set who were active in the Irish revival movement. 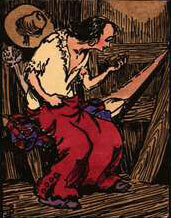 In the other case are three broadsides: A Broadside, No.8, January 1909, with an illustration by Yeats for a poem, “Theodore to His Grandson”; a broadside opened to two illustrations, “Tramps,” and, in color, “A Youthful Pirate”; and A Broadside, No. 1, June 1908, with an illustration for “Campeachy Picture.” There were 84 issues in the first series of Broadsides, and Jack Butler Yeats illustrated all, a total of 252 drawings. 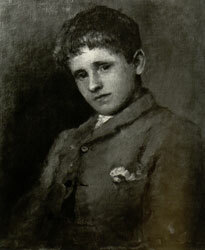 On the second floor, the exhibition begins with a case containing a reproduction of “Jack Butler Yeats as a Boy,” c.1887, an oil painting by Jack B. Yeats’ father, John Butler Yeats. There is also the curator’s welcome, another copy of the photograph first seen downstairs, a self-portrait of Jack Butler Yeats, c. 1920, included in Hilary Pyle’s Jack B. Yeats: A Biography, information about the Yeats family, Jack Butler Yeats’ early career, his return to Ireland and another time line. Other cases are organized by themes such as the Gaelic Revival, the Cuala Press, drawings and illustrations, A Broadside, drawings for other authors, books and plays, and scholars and critics. This is a very didactic exhibit in keeping with Róisín’s goal, to present “a complete picture of the literary and artistic world of Ireland at the time when he was painting.” She also noted that Yeats drew actual people and scenes and did not romanticize his subjects; there are numerous examples of such works in the exhibit. The Cuala Press section explains how certain Yeats family activities were intertwined. The press, originally Dun Emer Press, was renamed in 1908 when it came under the ownership of Jack B. Yeats’ sisters, Lolly and Lily, and examples of their publications are shown, including two works illustrated by Jack, On the Boiler and A Little Book of Drawings. Other examples of Jack’s works can be seen in the other cases, and they are accompanied by explanatory material which enriches our appreciation of the Irish artist and author. Because this exhibit is so comprehensive, the viewer may benefit from repeated visits, each time discovering new aspects of Jack Butler Yeats’ works. And after visiting “Jack B. Yeats: Drawings & Illustrations,” observers will recognize not just William Butler Yeats, but his brother Jack and other family members and their rich contributions to 20th century culture.